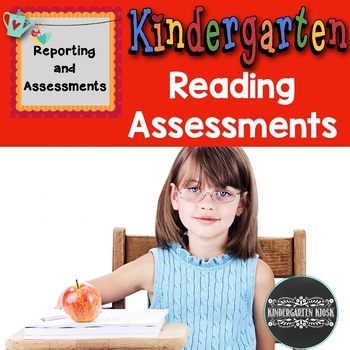 Organize important early literacy benchmark assessments! 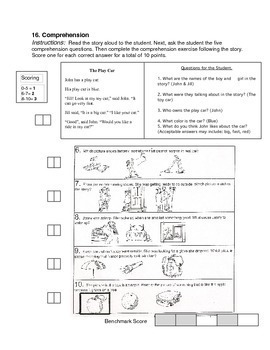 This assessment packet is filled with classroom tested, research based assessments depend on important research based reading skills. (This Version is not linked to Common Core Standards). Phonemic awareness skills tested are: Rhyme production, syllables, beginning sound, oral blending, and oral segmentation. 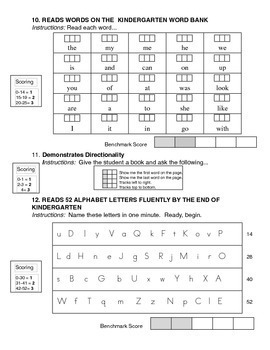 Phonics skills tested are: Alphabet recognition, alphabet letter sound recognition, decoding simple words, sight words, alphabet letter fluency, and alphabet sound fluency. Other important literacy skills tested are: Correct name formation, comprehension, and early vocabulary. The assessments are easy to mark, score and report. A rubric is provided with each assessment to easily convert the score to a grade level equivalency of 1-2 or 3 (Intensive Intervention, Strategic Intervention, Benchmark Achieved). 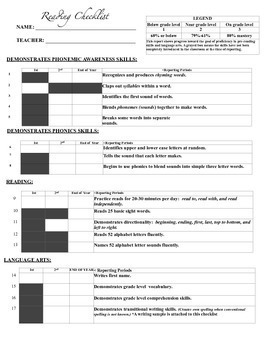 Also included with the packet is a benchmark checklist where scores can be easily recorded and reported to parents as to their child's progress! Rest assured that your students or your child will be on track with early reading skills by using this handy benchmark tool!